Well look who’s finally posting again! Yes, I went on an unintended hiatus there for a little while, not totally by choice. I apologize for my absence, but sometimes that’s just how it goes. What I do have for you today is a glimpse at a fundraiser dinner I went to back on March 9th. Yes, I know, way to be prompt, eh? Better late than never though, right? Let’s rewind back 2 weeks, shall we? I attended an Ethiopian themed dinner at Nyala African Cuisine. It was a fundraiser put on by some of my fellow dietetics students who are part of the GIVE Food Security and Nutrition Team. Delicious food, social time with classmates, and supporting a good cause – how could I say no? The meal was served up family style, so we were able to sample a variety of dishes. 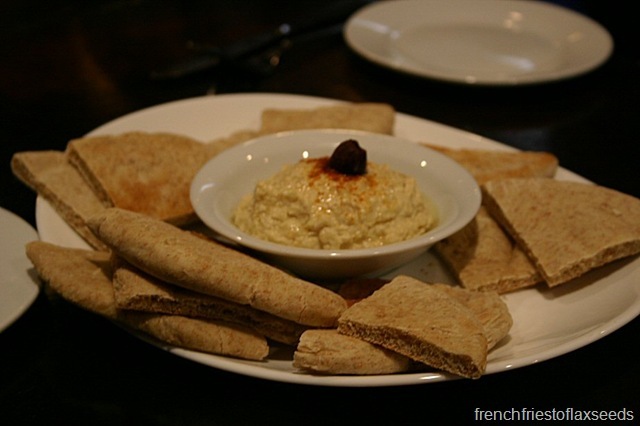 The appetizers included some hummus and pita (I know, not really Ethiopian, but it tasted great, so you couldn’t really complain). 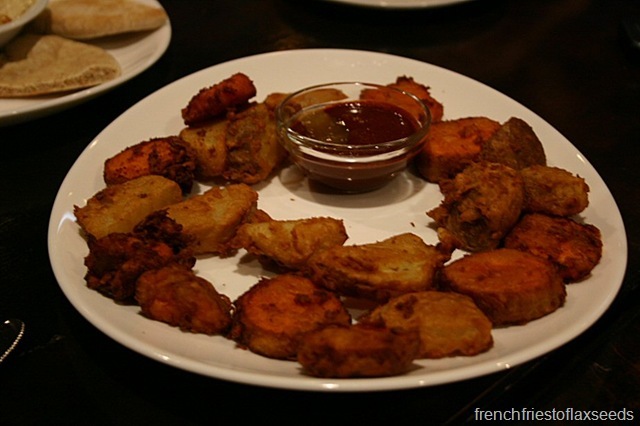 We were also served what the host called pakoras, although they didn’t look like the typical Indian pakoras I’ve eaten in the past. 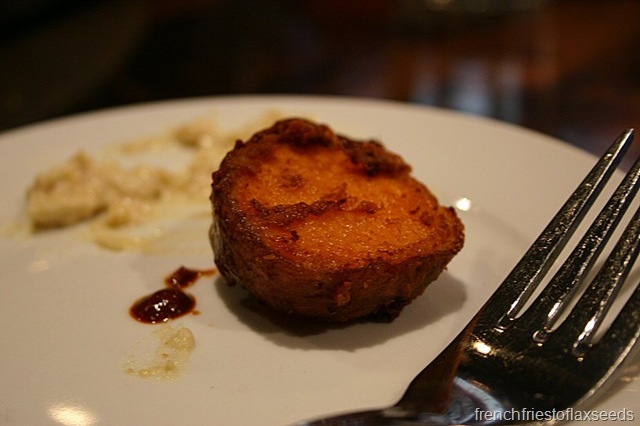 These crispy golden nuggets were simply regular and sweet potato in a sort of crispy coating, fried to perfection. They were served up with a spicy sweet sauce – something unfamiliar to me, but went perfectly with the little bites. It was tempting to fill up on the appetizers, but we knew there were more good eats coming our way, so we paced ourselves accordingly. 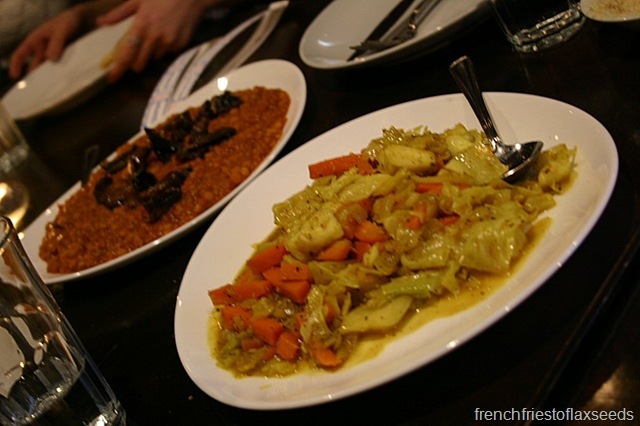 There were two vegetarian options served – the top one was a lentil dish with the most flavourful fried mushrooms, and the bottom was a cabbage, onion, and carrot dish that I’ve had at Ethiopian places before. It’s one of my favourites. 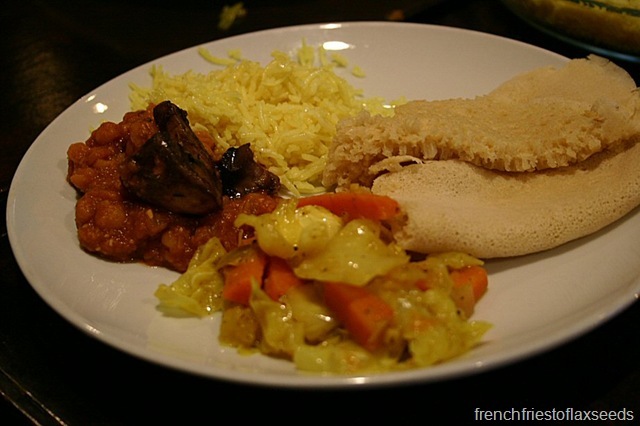 They also served rice and injera – an Ethiopian flat bread made with teff (a tiny little grain). I love me some injera – it’s so spongy and has a slightly acrid taste that really goes well with the curries and stews. Great for sopping up all the juices. There was also a coconut chicken dish brought out a bit later, but due to the poor lighting, I just couldn’t get a good photo. So instead, I shall share another of my plate sans chicken. I lucked out – at the end, there were still some leftovers, and I just so happened to have an empty container in my school bag, so I packed up a little lunch for myself the next day. Score! It was a great night out, and I would recommend checking out Nyala – the owner is super friendly, and they have some very tasty eats. I will definitely be back to try out some of their regular menu items. Mmm you’ve reminded me of how delicious Ethiopian food can be! I’m so glad you popped back in bby! I’ve missed you (and my niece)! What a yummy dinner 🙂 Injera is the best utensil I’v ever used. The food looks heavenly! I’m very intrigued by that Injera and the Pakora. You’ve definitely lucked out! I hope i’ll be able to eat some of that too someday. 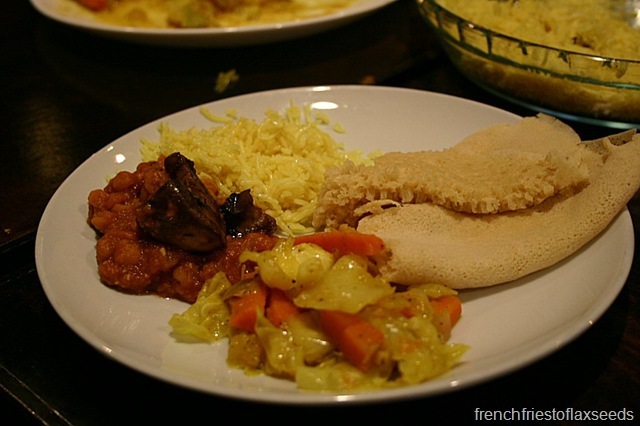 I have never had Ethiopian food before – looks delicious! !